Lindsay Miller of Lowell, Massachusetts, a self-described Pastafarian, has won her fight to wear a pasta strainer on her head in her driver's license photo. Arguing that her chosen headgear was part of her right to freely express and practice her religion, Miller was granted permission by the state of Massachusetts motor vehicles division on appeal after their initial refusal. 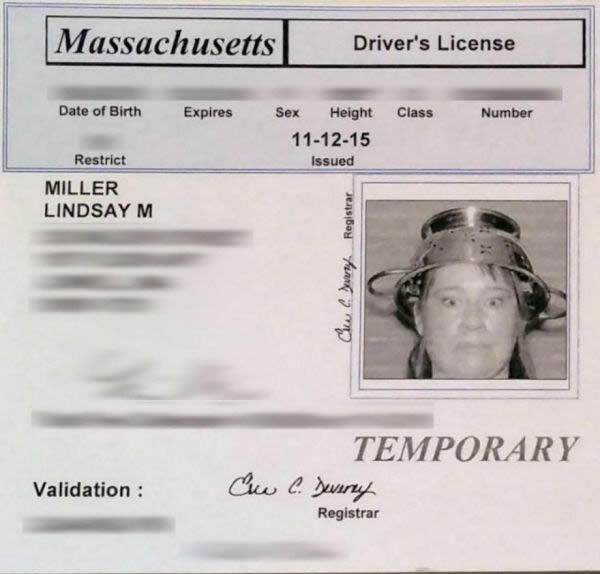 The Massachusetts DMV's website proclaims that drivers may not wear hats or head coverings in their license photos unless the items are “for medical or religious reasons.” Miller says she wore the strainer to show her devotion to the Church of the Flying Spaghetti Monster. A zany motorist with a good sense of humor and a lot of patience solved the problem of the embarrassing driver's license photo by deliberately creating the most awkward portrait he could. Prankster Daniel Mundschau, 37, worked hard on creating this hilarious and unique look, complete with a bald head, double chin, classic horseshoe mustache and a manic look in his eyes. 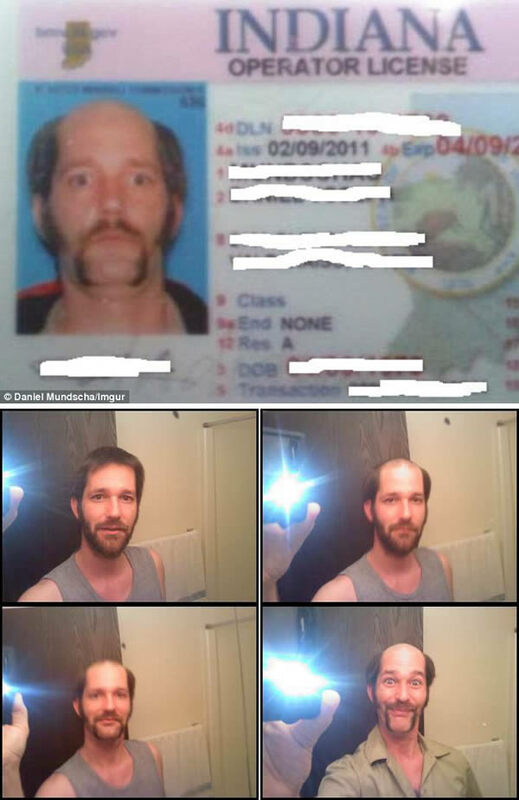 The practical joker put his Indiana ID up on Reddit and it received plenty of attention. Mundschau explained through a series of photos how he achieved his crazy look, starting with "one month of unchecked growth" for a "canvas to work with." He wanted to keep his crazy look strictly legal, so had to grow out his hair rather than the quicker option of a wig. He closely shaved his head for the effect of a "little male pattern baldness," then crafted his facial hair into big sideburns and a mustache. To complete the look, Mundschau crossed his eyes while keeping one on the camera, and pushed his head back to give the impression of a double chin. A driver's license is one of the most important identification tools in the United States. Anything of a sensitive nature that requires confirming a person's physical identity usually also involves checking someone's license. But now, Illinois is allowing Muslim religious garments in driver's license photos. This can include headdresses or scarves that would conceal part of the head. “While hats or head coverings are prohibited from being worn in photographs used on Illinois driver's licenses and identification cards, customers may be photographed while wearing established religious head coverings,” reads a flier distributed to state employees at the Illinois Department of Motor Vehicles. NOTE: While we initially claimed that Muslims would be able to wear burqa, veils or other garment that covers your face in your driver's license, in Illinois or any other US state, this was not correct. Yes, you can wear religious headgear on your Illinois driver's license, such as the hijab worn by Muslim women or the turban, which is common in men of the Sikh faith. These garments do not cover the face. This teen wants to retake her driver's license photo after she says the employees at the Anderson, South Carolina Department of Motor Vehicles made her take off her make-up. Chase Culpepper, 16, wears makeup and girl's clothing every day. She considers herself gender non-conforming. Culpepper says she went to the DMV with her mother to get her driver's license. 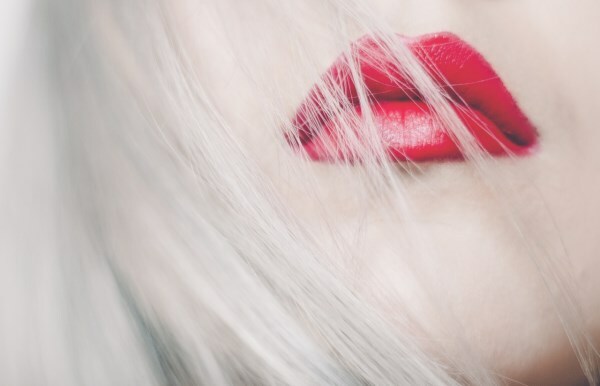 She said she had already passed the test but was told she could not have her picture taken while wearing makeup because she did not look the way a boy should. They let her wear pearl earrings, but demanded she remove the mascara and eye shadow she regularly wore before they would take her photo. Culpepper said she ultimately removed her makeup, but the Transgender Legal Defense and Education Fund is calling upon the DMV to allow Culpepper to retake her picture. At the time of the incident, she used male pronouns to refer to herself but now identifies as transgender and prefers female pronouns, the Transgender Legal Defense & Education Fund (TLDEF) said. 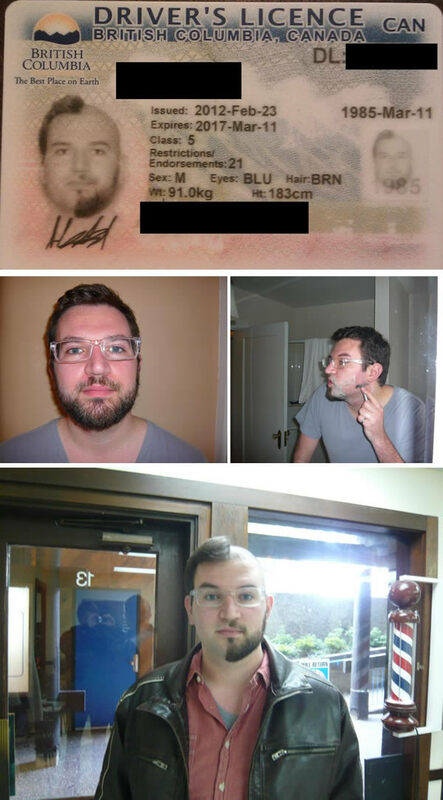 This dude from Reddit decided to get a novelty driver's license. Much like the second guy on our list, he dedicated several weeks to grow enough hair to create the perfect look for his driver's license photo. In most U.S. states, they won't even let you smile for your driver's license. In Japan, they'll not only let you smile, but they're fine if you're dressed in cosplay. 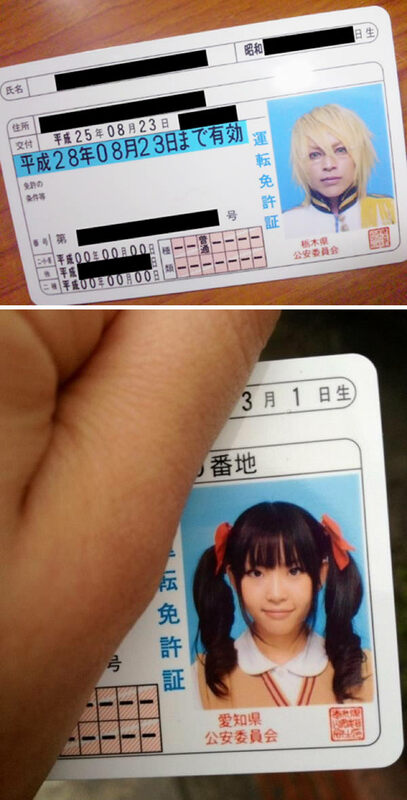 These “itai” driver's licenses are perfectly legal and feature everything from costumes to colored contacts to crossdressing, but there are limits—you still can't wear a hat, and you can't have a brightly colored wig. 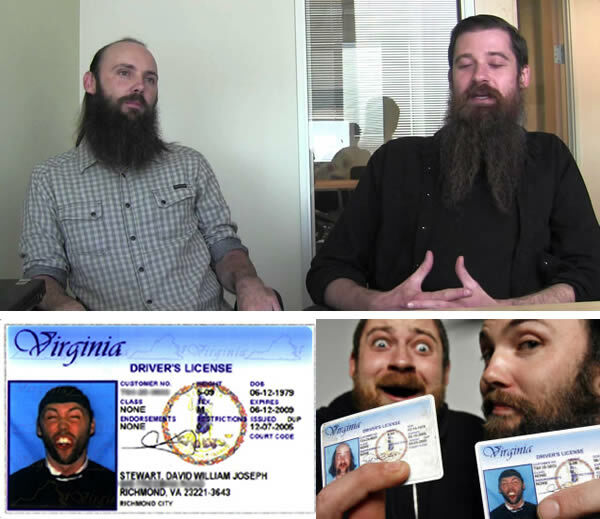 In 2006, Will Carsola and Dave Stewart, from the sketch comedy group DayByDay Productions, tried to see how ridiculous they could make themselves look for their driver's license photos and still be issued driver's licenses from the Virginia DMV. According to an article in the Richmond Times-Dispatch, the DMV didn't think the prank was funny and is working on changing their policies to prevent this from happening in the future. Carsola and Stewart also had to reshoot their driver's license photos. A former Minnesota police officer will receive more than $1 million in multiple lawsuit settlements after learning that dozens of her ex-co-workers illegally accessed her driver's license record just to gawk at her picture. The Minneapolis City Council agreed to pay Anne Marie Rasmusson $392,000, on top of a $280,000 settlement she reached with several other cities whose officers violated the law by accessing her records for personal reasons. The case marks one of the largest data breaches committed by law enforcement officials in history. An investigation into Minnesota's Dakota County Sheriff's office, as well as state troopers and Bloomington police, show that more than 100 officers—from chiefs on down—were using the database as their personal Facebook. Rasmusson, who was known by colleagues as Bubbles because of her cheerful personality, first became aware that other officers were looking up her photo when a former police academy colleague mentioned that she looked great and that he and his partner had used their squad car computer to view her image. In August 2011, she contacted the state's Department of Public Safety asking if it was possible to restrict access to her driver's license file. Following an investigation, a DPS worker revealed that her record had been accessed by officers numerous times. Officers are only supposed to look someone up for official reasons. That said, the incredible misuse of the database is astounding —City Pages found that 104 officers in 18 different state agencies accessed her driver's license 425 times.